The Marine Corps has been conducting flood relief operations for two months in Pakistan, which was ravaged by floods this summer that killed at least 1,500 people and destroyed an estimated 1.9 million houses, according to most estimates. One piece that couldn’t be overlooked before the U.S. pitched in was security. It’s no secret that Pakistan has a muscular anti-American insurgency, and is used as a staging ground for attacks on U.S. troops in neighboring Afghanistan. After landing in one remote spot of Kohistan, in a designated Provincially Administered Tribal Area, the Pakistani leader of a flight ordered a hasty evacuation after less than a minute on the ground, before any aid could be delivered. The order came after local tribesmen warned him and the security detail that Taliban or other armed men were hiding behind a hill near the landing spot, apparently waiting for offloading to begin to launch an ambush. The abandoned drop left both Pakistani and American personnel upset, not because of the near miss but because the three dozen men and boys waiting at the site desperately needed the food on board. “Look, it’s not the first time it’s happened,” said Pakistan Army Capt. Asad Mehmood, the safety pilot during the trip and the same man who ordered the hasty retreat. Mehmood downplayed the incident, insisting that it would be resolved the next day with a better security assessment and other precautions. The same story notes that all Marines and soldiers interviewed said their work in Pakistan is similar to providing logistic support in a combat zone. 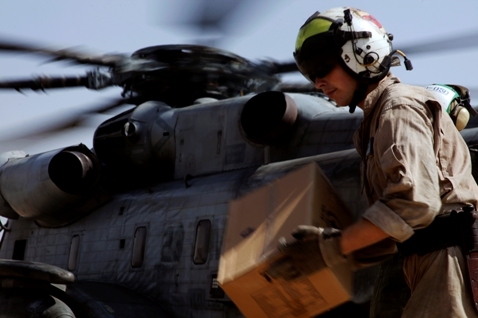 To date, the U.S. military has delivered more than 16 million pounds of supplies to more than 22,000 flood victims.